Ecophon Focus™ offers suspended wall to wall ceilings that cater to both the visual and acoustic needs of an indoor environment. How often do we look up, and admire the ceiling inside a building? 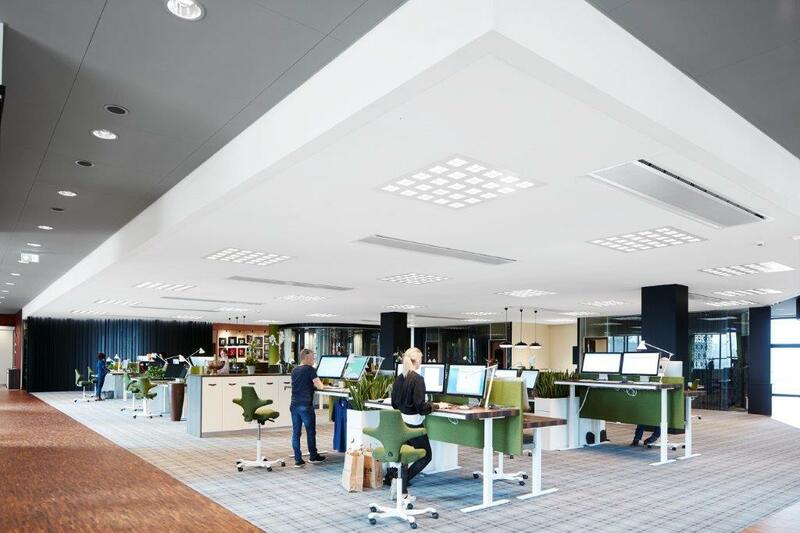 The aesthetic and acoustic role played by a ceiling cannot be underestimated, which is why Saint-Gobain Ecophon™ is continually developing products and systems that contribute to a good working environment by enhancing peoples’ wellbeing and performance. With roots in Swedish design tradition, this range enables elements to be perfectly aligned with the overall design and indoor architecture, whether the choice is for Ecophon Focus™ to seamlessly blend in by following the lines and shapes of the room or to make a statement by creating an eye-catching feature by emphasising colours and lines. People – How many will be using this space and who are they? Are there any special needs that need to be taken into account? Lastly the updated colour range includes sixteen colours inspired by nature. Akutex ™ FT is a unique and superior surface developed by Ecophon with great light reflector properties and, in combination with the glass wool, provides optimal acoustics. The Akutex™ FT label carries a guarantee that the product contains superior surface technology.